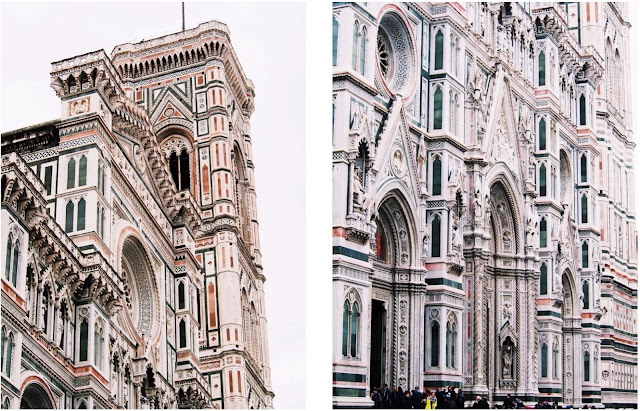 The first thing that we laid our eyes on when we arrived in Firenze (Florence) was the breathtakingly beautiful Cattedrale di Santa Maria del Fiore (Cathedral of Saint Mary of the Flower) but known as to the locals as Duomo di Firenze. That was the first thing we saw because luckily for us, our hotel was just about 20 steps from it, and although that was amazing, in a way it was torture, because well the first thing you have to do when you arrive somewhere is to check in the hotel, drop off the bags, refresh a bit and head out and explore. My eyes where itching to see the Duomo from up close and be able to capture it's grandeur, but my patience was to be tested that evening as we had to trek down a couple blocks to fetch the key to our room as we arrived late in the evening and our key was waiting for us at another sister hotel. Not to worry I told myself, because I was sure that this beauty looked even more splendid in the light of day, and so it was. I had to capture detail shots of the Duomo because one photo wasn't enough, I seriously could have spent my whole time in Florence starring at it, it was that impressive. The existence of the Duomo began in 1296 when Arnolfo di Cambio began to the Gothic design for it, with the dome engineered by Filippo Brunelleschi and it was completed in 1436, one hundred and forty years later. What attracted me the most and left an impression on me was the color choice, as I have never seen a cathedral with that combination before, which made it extra special and probably my top favorite cathedral I have seen in Europe. Although, I do have to point out that the inside of the cathedral is not as impressive as you would imagine from what you see outside, but beautiful none the less. My affinity to sweets never seems to fizzle, no matter where I go, I always find myself in adorable shops that hand make all of their goodies. I choose to visit places that put a lot of love in the products that they sell, there is something about that, that I find so special, maybe because I know it's made with so much love. This shop, which I forgot to write down the name (it is located really close to the Duomo), had some of the prettiest wrapped sweets I have ever seen, not to mention oh so good. The romantic in me as always dreamed of riding away on a horse carriage and so my dream came true on our first day in Florence, when we got to stroll part of the city with this beauty of a horse and it's carriage. The picturesque view from Ponte Vecchio (Old Bridge) where you can see Ponte Santa Trinita (Holy Trinity Bridge) in the distance. Ponte Vecchio is a Medieval stone closed-spandrel segmental arch bridge which goes over the Arno River and famous for it's built-in shops, which once was a common thing. The shops used to house butchers but over time a new breed of tenants began occupying the shops, such as jewelers, art dealers and souvenir shops. You know by now that I love doors and that I started documenting them as I will soon begin to built my wall of doors, of course I capture them on their own but the ones with me on it are purely for my Instagram. If you follow me on Instagram, you saw the photo below I posted while I was in Florence, these two adorable boys were so into their karate fighting (yes they were karate fighting) that they failed to see I was trying to capture a moment and totally photo bombed. Like the old saying goes, if you can't beat them, join them and so I told my friend to just capture the moment as it was, and it has become my favorite photo I have of myself in Florence. Also another favorite moment capture in time, was of us three girls playing silly. The jewelry shopping madness on Ponte Vecchio, which ranges from new jewelry to vintage jewelry shops. I, of course was much more drawn to the vintage shops then the new, because well you all know I love vintage. We managed to have a jaw-drop moment when we went into one vintage shop that had the most amazing ring I had ever seen, and I have to say the price was really not bad at all for the type and era of ring, so you can find yourself good stuff here. This is Palazzo Vecchio (Old Palace) and is now the Town Hall of Florence, as well as a museum, with it's Romanesque style, this palace is one of the most impressive of the Tuscan region. A little trivia about the tower, it once imprisoned Italian figures during the 15th century, it has three bells, one of which was cast in the 13th century and the large one-handed clock was originally made in 1353 by the Florentine Nicolò Bernardo, but in 1667 was replaced by a replica made by Georg Lederle from the German town of Augsburg, but Italians called him Giorgio Lederle of Augusta. Peaking at the bottom middle of the photo is the statue of Neptune, in his fountain, called Fountain of Neptune. The statue was commissioned for the wedding of Francesco I de' Medici with Johanna of Austria in 1565 (one of her daughters, Marie de Medici was the second wife to King Henry IV of France). The face was made to resemble that of Cosimo I de' Medici, father of Francesco, to create an allusion of the control the Florentines had over the sea. The original statue of Neptune sits in the National Museum. 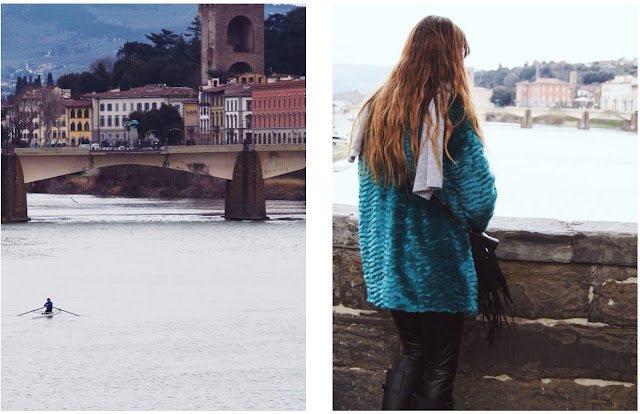 Hope you enjoyed part I of Florence, more to come in the upcoming days. Yay for a girl's getaway and the Duomo shots are amaze.